Have you had your adjustment today? Patient FR came into my office in late May 2013 complaining of severe lower back pain with severe numbness in his right upper thigh and a feeling that he described as if his feet were on fire as well as numbness in his hands and a stiff neck. His condition started six months ago and has been getting worse. He stated that he lost his house in Hurricane Sandy and worked 12-15 hours a day for 6 months straight to try and get his home back to normal. He was diagnosed with sciatica and carpal tunnel syndrome. After a lengthy spinal analysis and X-Rays of the neck and lower back, I determined that patient FR had suffered a pinched nerve in his neck and in the upper and lower lumbar spine. 12 Chiropractic Adjustments later and patient FR felt no neck stiffness and no lower back pain and no more numbness in his hands. He still had burning in his feet. Patient FR continued with Chiropractic care at a rate of 3 visits per week and occasionally 2 visits per week and he is now almost completely symptom free. Removing the nerve interference’s within the cervical and lumbar spine of patient FR has allowed the patient, FR, to repair and restore himself back to normal. Chiropractic is a health care profession that focuses on disorders of the musculoskeletal system and the nervous system, and the effects of these disorders on general health. Chiropractic care is used most often to treat neuromusculoskeletal complaints, including but not limited to back pain, neck pain, pain in the joints of the arms or legs, and headaches. Doctors of Chiropractic – often referred to as chiropractors or chiropractic physicians – practice a drug-free, hands-on approach to health care that includes patient examination, diagnosis and treatment. Chiropractors have broad diagnostic skills and are also trained to recommend therapeutic and rehabilitative exercises, as well as to provide nutritional, dietary and lifestyle counseling. The most common therapeutic procedure performed by doctors of chiropractic is known as “spinal manipulation,” also called “chiropractic adjustment.” The purpose of manipulation is to restore joint mobility by manually applying a controlled force into joints that have become hypomobile – or restricted in their movement – as a result of a tissue injury. Tissue injury can be caused by a single traumatic event, such as improper lifting of a heavy object, or through repetitive stresses, such as sitting in an awkward position with poor spinal posture for an extended period of time. In either case, injured tissues undergo physical and chemical changes that can cause inflammation, pain, and diminished function for the sufferer. Manipulation, or adjustment of the affected joint and tissues, restores mobility, thereby alleviating pain and muscle tightness, and allowing tissues to heal. Chiropractic adjustment rarely causes discomfort. However, patients may sometimes experience mild soreness or aching following treatment (as with some forms of exercise) that usually resolves within 12 to 48 hours. In many cases, such as lower back pain, chiropractic care may be the primary method of treatment. When other medical conditions exist, chiropractic care may complement or support medical treatment by relieving the musculoskeletal aspects associated with the condition. Doctors of chiropractic may assess patients through clinical examination, laboratory testing, diagnostic imaging and other diagnostic interventionsto determine when chiropractic treatment is appropriate or when it is not appropriate. Chiropractors will readily refer patients to the appropriate health care provider when chiropractic care is not suitable for the patient’s condition, or the condition warrants co-management in conjunction with other members of the health care team. Register for your Free Spinal Exam. NECK ACHE? STIFF NECK? 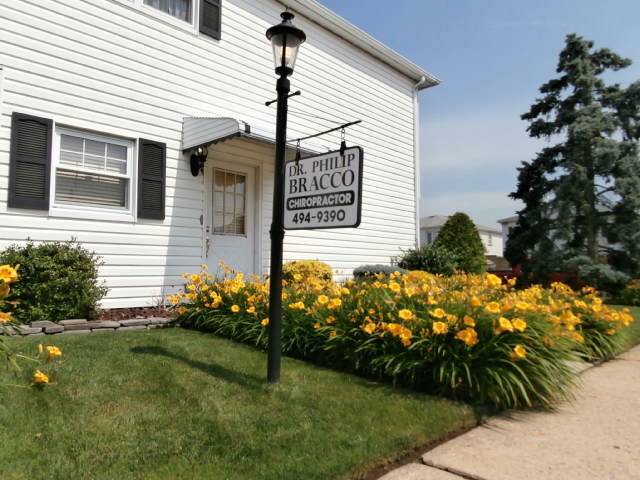 BRACCO CHIROPRACTIC CAN HELP YOU! Are you walking around with a stiff neck or neck pain for days, weeks, maybe even months???? If it gets really bad you can have pain radiating to your upper shoulder muscles, in between your shoulder blades, down your arms to your fingers, even numbness. Your answer can be as simple as Chiropractic adjustments. I have been taking care of patients with these symptoms for the last 32 years and I have been very successful with it. Why suffer with this problem?? Call me and make an appointment to start feeling better today. Don’t wait any longer, get back to your life, having fun, and doing all those things you used to do!!!! NECK PAIN? STIFF NECK? BRACCO CHIROPRACTIC CAN HELP YOU! Are you walking around with a stiff neck or neck pain for days, weeks, maybe even months???? If it gets really bad you can have pain radiating to your upper shoulder muscles, in between your shoulder blades, down your arms to your fingers, even numbness. Your answer can be as simple as Chiropractic adjustments. I have been taking care of patients with these symptoms for the last 35 years and I have been very successful with it. Why suffer with this problem?? Call me and make an appointment to start feeling better today. Don’t wait any longer, get back to your life, having fun, and doing all those things you used to do!!! !